Today, #DamienTalks with Seleta Reynolds, the General Manager of the Los Angeles Department of Transportation about the City of Los Angeles’ recent announcement that L.A. will be a Vision Zero City. In short, that means that all planning, construction and enforcement decisions that impact the transportation grid will be based on whether or not it helps the city reach a goal of zero traffic deaths. In addition to being one of the city’s leaders and organizers on this issue, Reynolds has some experience with Vision Zero from her time in the Bay area. We ask her about this experience, what L.A.’s plans are, and the uncomfortable question about law enforcement’s role. 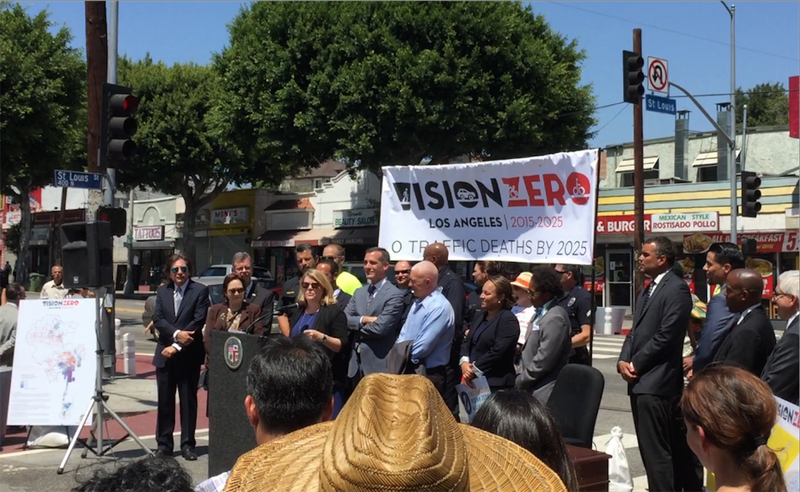 If you’re looking for more, here’s some of Joe Linton’s recent coverage of Vision Zero in Streetsblog Los Angeles: City Announces Vision Zero Strategy, Council Passes Mobility Plan Including Vision Zero, Sustainable City PLAn Includes Vision Zero, LADOT Focuses on Vision Zero in 2014 Annual Report. The L.A. City Transportation Committee approved a plan to dedicate nearly all Measure M local return funding - $66M annually - to Vision Zero, including funds for sidewalks and bike facilities.